I've never been a big fan of potato salads but I happen to really like this one. The key this potato salad is the lemon. Lemon adds just the right amount of freshness to the creamy dressing. I like to use red potatoes because the pink colour is lovely in this salad and there is no peeling involved. Perfect for when I'm feeling a little lazy. :) Enjoy! 1. Cook potatoes in a large pot of boiling salted water until tender. This should take about 15 minutes. Drain the potatoes and allow them to cool down to room temperature. 2. For the dressing, combine the celery, herbs, mayonnaise, lemon juice, zest and balsamic vinegar. Season it with salt and pepper to taste. 3. Gently fold the dressing into the potatoes taking care not to break them. 4. Keep the potatoes refrigerated. Let them stand at room temperature for 1/2 hour before serving. 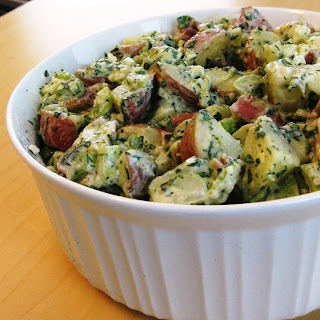 I have a weak spot for potato salads, this recipe is great, thanks. oh dear - that looks like a delicious potato salad recipe! I love potatoes salad, but I never made one yet. Thanks for sharing. I will consider making it soon. WOw this looks so delish. I can imagine the wonderful flavours in that salade. Delicious salad, with all those herbs, am damn sure they would have tasted divine! Sounds delighful with lemons and herbs! i have the smae thing about potato salad. but lemon is really a good way to make it lighter. Ah, Thank You! I've been looking for a good potato salad! This is one potato salad I can do! Looks very tasty and perfect for summer! This is calling my name.. herby delish. What a different take on potato salad! Sounds refreshing with the lemon and totally delicious!!! I can see why you liked this salad, even when you are not a big fan of potato salads. all those herbs and lemon would give it a very nice flavor. I'm not a big fan of potato salads either, but this one sounds good. I will have to try it out this summer! I'm a huge fan of vinegar/citrus based potato salads. Yours looks just lovely. And so fresh for the spring! YUM. That looks absolutely scrumptious--and sounds deliciously different! I love the addition of the lemon and all the herbs. One to be tried for sure. Your salad is so colorful and it looks great! Beautiful. I love a good potato salad and yours with the herbs and lemon sounds fabulous. Fantastic riff on a summer standard! How perfect is this?! I definitely have to make this for my next picnic! This is my kind of potato salad. Love it! Mmmm, I love the freshness of this potato salad and the great addition of herbs. Much nicer than the typical heavy stuff. I do enjoy a good spud salad, I must try it out with cilantro...a new twist for me but I'm willing to jump in & try it.